The French Air Force Chief of Staff, General Jean-Paul Palomeros, has been conferred Singapore’s prestigious Meritorious Service Medal in recognition of his efforts in forging ties between the French Air Force (FAF) and the Republic of Singapore Air Force (RSAF). Since 2002, FAF has provided support for the RSAF’s Advanced Jet Training (AJT) at Cazaux Air Base in France. The Five Stars General then met our Three Star General, Lieutenant-General Neo Kian Hong, Chief of Defence Force and together they visited the Singapore Airshow 2012. 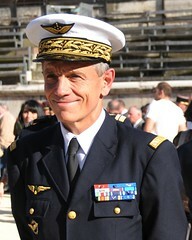 Jean-Paul Paloméros (born 1953) is the 49th Chief of Staff. He attended the prestigious École de l’Air (French Air Force training facilities for the officers), class of 1973. He got his wings in 1976 with 3,500 flight hours. General Paloméros is a Rafale pilot. He became the Chief of Staff of the French Air Force on 25 August 2009.
part of your home’s interior decor. The wood blinds can be substituted with the faux wood blinds these days. “”I think this is one of the most vital information for me. And iвЂ™m glad reading your article. But wanna remark on some general things, The web site style is wonderful, the articles is really nice D. Good job, cheers”"